The latest Splinter Cell game’s subtitle lets you know that you’re not in for a typical Sam Fisher adventure. This time out Sam crosses the line into the world of espionage as he must go undercover to infiltrate a domestic terrorist group known as John Brown’s Army (JBA) and learn just what they’re planning to do before it’s too late. While there is still plenty of the acrobatic stealth action that the series is known for, the double agent aspect adds a whole new component to the game that will pique the interest of even the most jaded Sam Fisher fan. Being a double agent is not the easiest thing to do, to say the least. You’ve got to earn the trust of the group you’re infiltrating without losing that of the agency that sent you undercover. The game does a good job of simulating this delicate balance by maintaining two trust meters – one for the JBA and the other for the NSA. Lose the JBA’s trust and your cover is blown and you’re lucky if you don’t find yourself dead. Lose the NSA’s trust and you’ll be pulled out of the mission immediately. 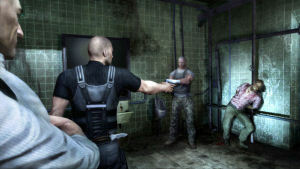 The trust meters wouldn’t carry much weight unless you were presented with situations that forced you to toe the line between being an undercover agent and becoming a terrorist, so the game serves up plenty of moral dilemmas that cause Sam’s morals to get into a tug of war with his sense of duty. Sometimes it’s merely a question of serving two masters like when you are running errands around a JBA base while planting bugs for the NSA. At other times it’s the gut-wrenching decision of whether or not to kill a civilian to maintain the JBA’s trust. The gameplay itself hasn’t changed much since the last generation of Splinter Cell games. All the moves that you’ve come to know and love in the past – the shimmies, ziplines, scissor kick jumps, … - all available in Double Agent. If you’re new to the series the game includes a VR training exercise that serves as a tutorial, but these exercises cover very little of the gameplay and concentrate primarily on the basics. To make matters worse, if you’re new to the game you’ll find them a bit frustrating. The game pretty much assumes that you’re a series veteran so newcomers may want to cut their teeth on a prior game in the series. With the stealth aspects similar to before, Double Agent will appeal to you if you enjoyed other Splinter Cell games and won’t change your mind if you didn’t. The enemy AI in the game is pretty good for the most part, but your biggest overall challenge is the trial and error nature of the gameplay. There will be plenty of occasions where you’ll find yourself dying a couple of times before you figure out where you should be going or what you should be doing. Double Agent adds a number of mini game style exercises at key plot points, such as the struggle to save a crashing helicopter, that make for some interesting interludes to the core stealth gameplay. Missing from Double Agent are health packs, as you now recover health on your own once out of the line of fire. This doesn’t change the fact that you can die pretty quickly if you’re spotted and come under fire, though.